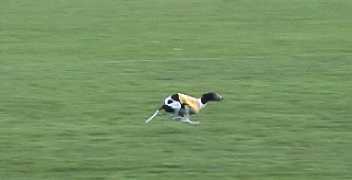 On October 14, 2000, at the Polo Field near Roy, Washington, I entered my seventh official ASFA Lure Coursing event, sponsored by W.R.A.G. 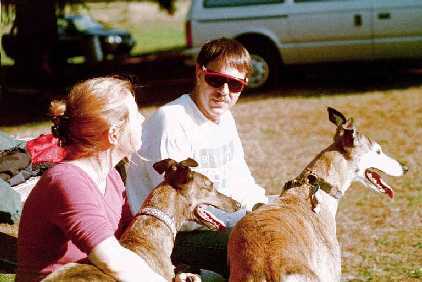 My new friends, Dan and Denise, the greyhounds, came out to watch. Dan had raced when he was younger, but Denise has never raced before. Even so, they were REALLY interested in what was going on out there on the field! That's Denise on the left and Dan on the right, with their people, Laurie and Chris. There were 9 field champions running this time. For my preliminary run, I ran with Guy and Lily. In the Final run, I ran with Rosa and Haze. 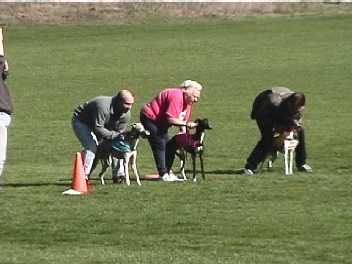 Toward the end of the course, Rosa saw her "daddy" on the sideline and went over there instead of following the lure to the finish line! Here's Daddy at the starting line telling me to get the bunny! Haze is on the left in blue, and Rosa is in pink. After the scores were totaled up, Lily and I were tied for 2nd and 3rd place. So we got to run again. This time, on the first sharp turn, I slipped on the wet grass and fell and rolled over! But I got my feet back under me and quickly caught up with Lily! Lily ended up with 2nd place and I got 3rd. 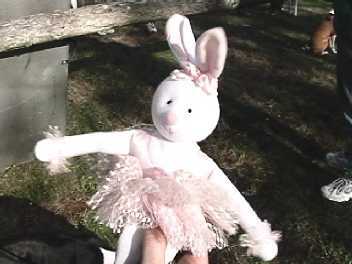 I got a yellow ribbon and this cute ballerina bunny! The judges were David Kingery, from Issaquah, WA and Don Papin, from Anderson, CA.